Core ML gives the potential for devices to better serve us rather than us serving them. This adheres to a rule stated by developer Eric Raymond that a computer should never ask the user for any information that it can auto-detect, copy, or deduce. This article is an excerpt taken from Machine Learning with Core ML written by Joshua Newnham. 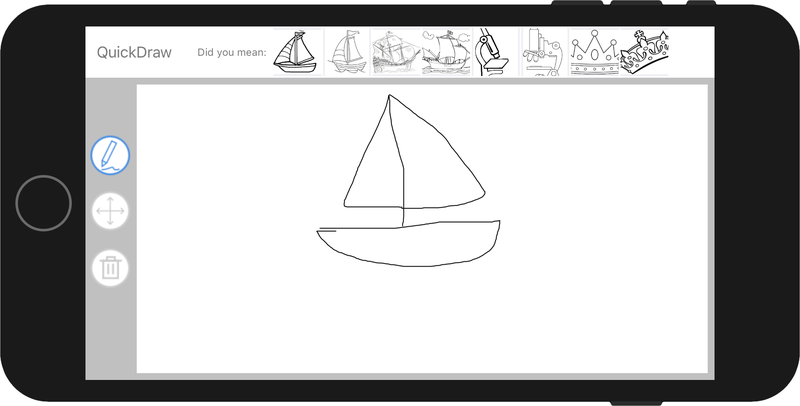 In today’s post, we will implement an application that will attempt to guess what the user is trying to draw and provide pre-drawn drawings that the user can substitute with (image search). We will be exploring two techniques. The first is using a convolutional neural network (CNN), which we are becoming familiar with, to make the prediction, and then look at how we can apply a context-based similarity sorting strategy to better align the suggestions with what the user is trying to sketch. We will be using a slightly smaller set, with 205 out of the 250 categories; the exact categories can be found in the CSV file /Chapter7/Training/sketch_classes.csv, along with the Jupyter Notebooks used to prepare the data and train the model. The original sketches are available in SVG and PNG formats. Because we’re using a CNN, rasterized images (PNG) were used but rescaled from 1111 x 1111 to 256 x 256; this is the expected input of our model. The data was then split into a training and a validation set, using 80% (64 samples from each category) for training and 20% (17 samples from each category) for validation. With our model trained, our next step is to export it using the Core ML Tools made available by Apple (as discussed in previous chapters) and imported into our project. Here we will walk through importing the Core ML model into our project and hooking it up, including using the model to perform inference on the user’s sketch and also searching and suggesting substitute images for the user to swap their sketch with. Let’s get started with importing the Core ML model into our project. As with all our models, we verify that the model is included in the target by verifying that the appropriate Target Membership is checked, and then we turn our attention to the inputs and outputs, which should be familiar by now. We can see that our model is expecting a single-channel (grayscale) 256 x 256 image and it returns the dominate class via the classLabel property of the output, along with a dictionary of probabilities of all classes via the classLabelProbs property. Each time the user ends a stroke, we will start the process of trying to guess what the user is sketching and search for suitable substitutes. This functionality is triggered via the .editingDidEnd action method onSketchViewEditingDidEnd, but will be delegated to the class QueryFacade, which will be responsible for implementing this functionality. This is where we will spend the majority of our time in this section and the next section. It’s also probably worth highlighting the statement queryFacade.delegate = self in the previous code snippet. QueryFacade will be performing most of its work off the main thread and will notify this delegate of the status and results once finished, which we will get to in a short while. weak var delegate : QueryDelegate? QueryFacade is only concerned with the most current sketch. Therefore, each time a new sketch is assigned using the currentSketch property, queryCanceled is set to true. During each task (such as performing prediction, search, and downloading), we check the isInterrupted property, and if true, we will exit early and proceed to process the latest sketch. if let img = sketch.exportSketch(size: nil)? Here, we see that the classifySketch is overloaded, with one method accepting a Sketch and the other a CIImage. The former, when called, will obtain the rasterize version of the sketch using the exportSketch method. If successful, it will resize the rasterized image using the targetSize property. Then, it will rescale the pixels before passing the prepared CIImage along to the alternative classifySketch method. Pixel values are in the range of 0-255 (per channel; in this case, it’s just a single channel). Typically, you try to avoid having large numbers in your network. The reason is that they make it more difficult for your model to learn (converge)—somewhat analogous to trying to drive a car whose steering wheel can only be turned hard left or hard right. These extremes would cause a lot of over-steering and make navigating anywhere extremely difficult. Here, we use the images, toPixelBuffer method, an extension we added to the CIImage class, to obtain a grayscale CVPixelBuffer representation of itself. Now, with reference to its buffer, we pass it onto the prediction method of our model instance, sketchClassifier, to obtain the probabilities for each label. We finally sort these probabilities from the most likely to the least likely before returning the sorted results to the caller. The downloadImages method takes the arguments searchTerms, searchTermsCount, and searchResultsCount. The searchTerms is a sorted list of labels returned by our classifySketch method, from which the searchTermsCount determines how many of these search terms we use (defaulting to 4). Finally, searchResultsCount limits the results returned for each search term. The preceding code performs a sequential search using the search terms passed into the method. 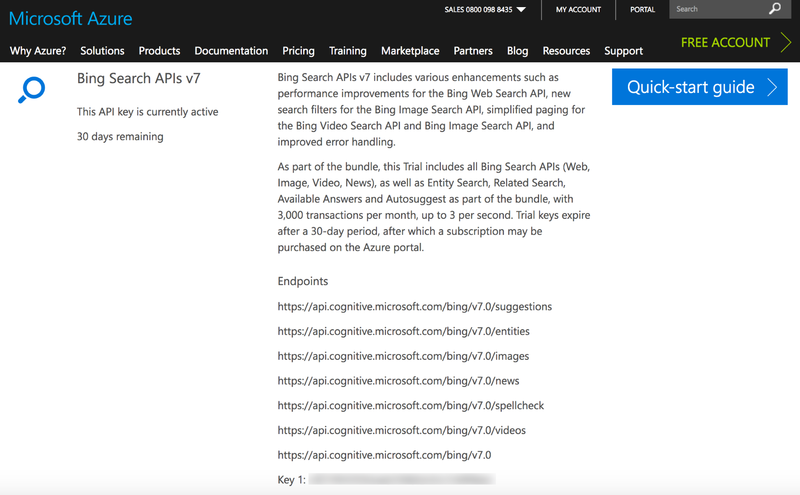 And as mentioned previously, here we are using Microsoft’s Bing Image Search API, which requires registration, something we will return to shortly. After each search, we check the property isInterrupted to see whether we need to exit early; otherwise, we continue on to the next search. As before, the process is synchronous and after each download, we check the isInterrupted property to see if we need to exit early, otherwise returning the list of downloaded images to the caller. It’s a large block of code but nothing complicated; let’s quickly walk our way through it. We start by calling the classifySketch method we just implemented. As you may recall, this method returns a sorted list of label and probability peers unless interrupted, in which case nil will be returned. We should handle this by notifying the delegate before exiting the method early (a check we apply to all of our tasks). Once we’ve obtained the list of sorted labels, we pass them to the downloadImages method to receive the associated images, which we then pass to the sortByVisualSimilarity method. This method currently returns just the list of images, but it’s something we will get back to in the next section. Finally, the method passes the status and sorted images wrapped in a QueryResult instance to the delegate via the main thread, before checking whether it needs to process a new sketch (by calling the processNextQuery method). 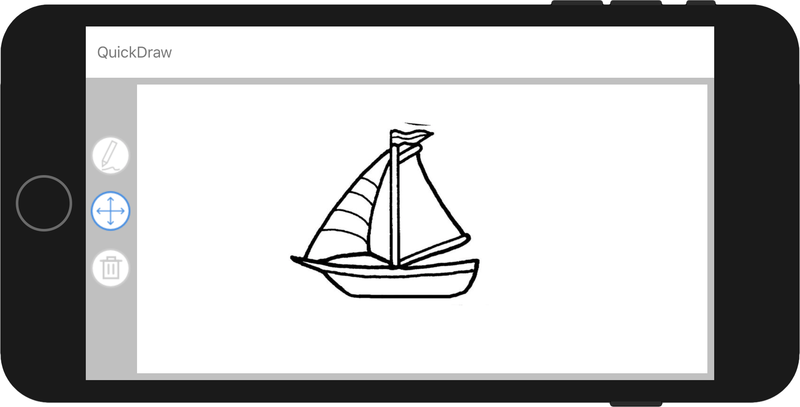 At this stage, we have implemented all the functionality required to download our substitute images based on our guess as to what the user is currently sketching. 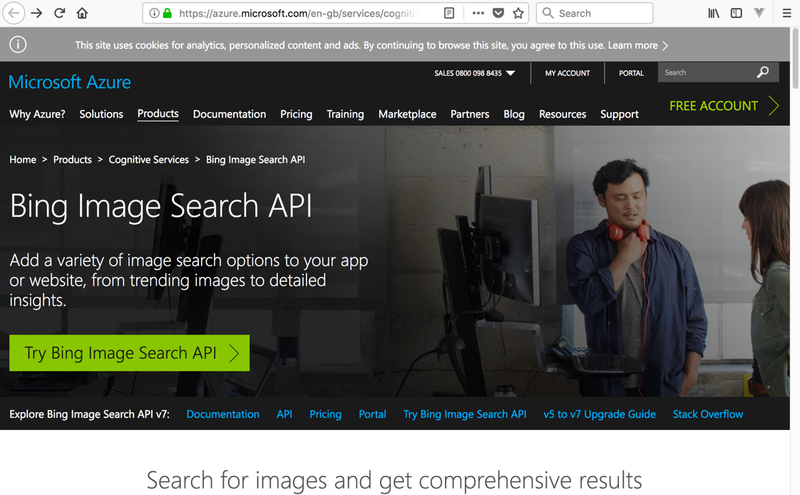 Now, we just need to jump into the SketchViewController class to hook this up, but before doing so, we need to obtain a subscription key to use Bing’s Image Search. There is one more thing left to do before finishing off this section. Remembering that our goal is to assist the user to quickly sketch out a scene or something similar, our hypothesis is that guessing what the user is drawing and suggesting ready-drawn images will help them achieve their task. So far, we have performed prediction and provided suggestions to the user, but currently the user is unable to replace their sketch with any of the presented suggestions. Let’s address this now. We have defined a simple class that is referencing an image, origin, size, and label. The origin determines the top-left position where the image should be rendered, while the size determines its, well, size! To satisfy the Sketch protocol, we must implement the properties center and boundingBox along with the methods draw and exportSketch. Let’s implement each of these in turn, starting with boundingBox. We now have an implementation of Sketch that can handle rendering of rasterized images (like those returned from our search). Our final task is to swap the user’s sketch with an item the user selects from the UICollectionView. Return to SketchViewController class by selecting the SketchViewController.swift from the left-hand-side panel in Xcode to bring it up in the editor area. Once loaded, navigate to the method collectionView(_ collectionView:, didSelectItemAt:); this should look familiar to most of you. It is the delegate method for handling cells selected from a UICollectionView and it’s where we will handle swapping of the user’s current sketch with the selected item. We learned how to build Intelligent interfaces using Core ML. If you’ve enjoyed reading this post, do check out Machine Learning with Core ML to further implement Core ML for visual-based applications using the principles of transfer learning and neural networks. Voice, natural language, and conversations: Are they the next web UI?